What Are My ELI Requirements? 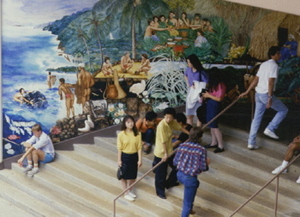 The University of Hawai`i at Manoa has a policy for granting students “back credits” for proven proficiency in a second or foreign language taught at UH Manoa. Click here to read the official policy. In a sense, this means the university is giving you credits for your language ability. You could be eligible to get as many as 16 credits for your native-language ability. 16 free credits means that you could shorten the amount of time it takes to get a Bachelor’s degree by one semester or more! What does the ELI have to do with it? When this policy was first discussed, the committee developing it was thinking primarily of native speakers of English who have ability in a foreign language. In the early stages of discussion, the ELI talked to the committee about the right of all second-language speakers of English to be eligible for back credits, as well. We are confident that our involvement helped to make sure that you now have this opportunity. We know that it is very frustrating for ELI students not to get credit for ELI classes, and we share your frustration. We strongly feel that our students deserve some kind of acknowledgement for their ability to handle academic study in a second language, and that is why we advocated for all second-language speakers of English at the university to be eligible for back credits. And now, we want to make sure all ELI students are aware that this policy exists, and that you might be eligible for back credits. Am I eligible for back credits? © 2019 English Language Institute.